Profusion zinnias (z. angustifolia) have won a favorite place in my garden. I love the bright, cheery little flowers they produce. They keep on blooming when everything else is exhausted from heat and humidity. I planted a few last spring and was so pleased with their performance, I planted nine flats this spring. So far I have not been disappointed. My old-fashioned zinnias have horrible-looking foliage by the end of June, but these little babies still look great. Profusion zinnias come in three colors: white, vivid orange and cherry. They mound very similar to impatiens. The flowers are 2 1/2-inch single, daisy-like flowers. They grow 8 to 12 inches tall and spread 12 to 24 inches. The plants resist powdery mildew and bacterial leaf spot. No pinching or pruning is needed to have continuous blooms. What more could you want from a plant? It is a hands-off gardening type of plant and is perfect for our hot Texas summer. I have three colors mixed in mass planting in my flowerbeds in front of my house. I randomly planted others to have splashes of color in various beds. They also grow well in containers. They started blooming in May and should continue blooming until the first frost. Sunny beds and not too much water are the tricks to having full plants. Several of my plants ended up in partial shade and have stayed small and leggy but keep blooming. I also planted them in the same sprinkler station with impatiens and have had to hand water the impatiens. It was really not a problem until I went on vacation for two weeks and had to get someone to water the impatiens. So remember those different stations and keep like plants in mind. The orange variety has been my favorite. That was a surprise because I am not wild about orange. It is a great flower for UT fans. It is the easiest to grow and the showiest. Also, the orange is the only one that reseeded from the previous summer. The white and cherry are very hard to start from seed and better started from small plants. In one bed along a fence, I put some melampodium (Melampodium leucanthum) yellow variety behind the orange profusion zinnias and it made a great show of color. The melampodium is another plant that blooms all summer and requires the same amount of sun and water although it can take a little more shade than the profusion zinnias. It is a great companion plant for this variety of zinnias. It is important when doing companion planting that you make sure your plants have the same requirements of soil, sun and water. Melampodium also comes in white but does not grow as tall as the yellow variety. The while grows to about 12 inches and the yellow gets about twice that size. Both spread to 12 to 15 inches and reseed like crazy. The seed packet recommends spring planting, but our hot weather last longer than other areas. It's probably not too late to enjoy these if you get your seeds planted quickly. They thrive in hot weather and perform best if planted from late April until August. Late summer plantings may need additional watering attention to ensure germination and young healthy plants. 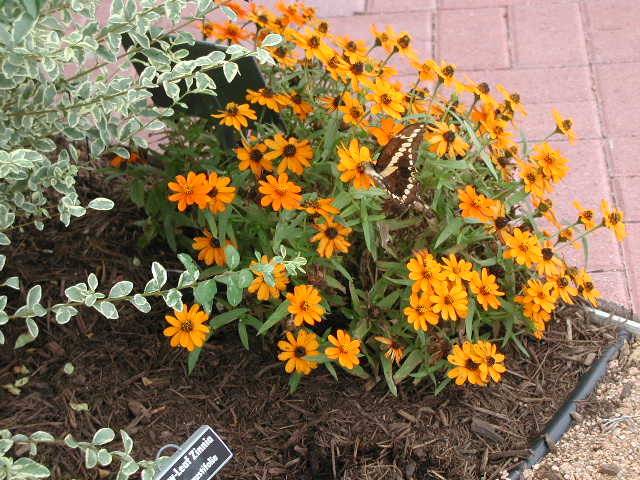 Another alternative--a gardening friend did buy profusion zinnia plants in a local nursery in the first week of July. The profusion zinnias hve won the All-American Selection award due to the ease of growing, length of flowering and disease resistance. This is a great plant in my yard. If you would like to see the profusion zinnias in bloom, it is planted in the Victoria Educational Garden. The profusion zinnias are a guarantee that you will have some color in the high heat of our Texas summer.